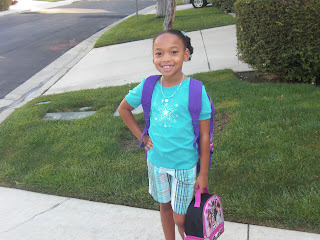 Today August 31,2009 my Sweet Pea began the 2nd grade. Since we moved we are now attending a new school, in a new district. That means a new teacher and new friends. However we are fortunate enough to live about 5 min from the school so getting there on time shouldn't be an "issue" unless we're having a "slow" morning. Even though Sweet Pea is 7 and we've had our "first day of school" before. Each year it is just as difficult as the first. The first two times ( pre-school and Kindergarten) I cried when I dropped her off. This time I didnt cry but I am still filled with apprehension. But only the type that mothers worry about. Will they be nice to her? What if she ends up eating lunch by herself? I want my baby to enjoy her day but not be scared or lonely. I pray that she makes friends and that the kids and her teacher are nice. More importantly I am praying that she LEARNS. I am also praying for her to be an example to her fellow students. To be a leader and not a follower and to keep her standards and morals in tact. we are now back to our regularly scheduled program. 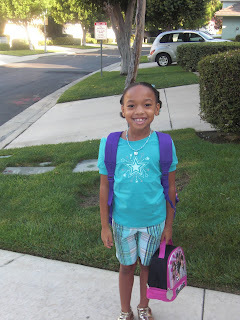 Happy first day of Second grade Sweet Pea!